Above: Spanish playing cards exported to new Spanish colonies from c.1550 onwards. Cards like these would have been in use in Cuba for the first 300 years or so after the first Spanish settlers arrived. 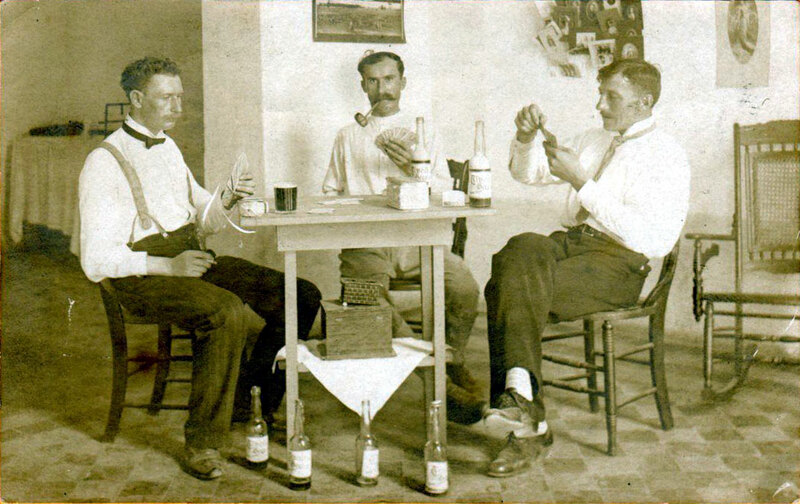 Cuba has not been a major producer of playing cards, partly for economic reasons and also because cards have been banned since the revolution of 1959. During the colonial years and afterwards, Spanish-suited packs were imported from Spain, notably Seville, Málaga, Barcelona and Cádiz. The example shown below was produced in Germany. Above: Wüst Spanish Cadiz pattern deck for export to Cuba c.1910, advertising ‘Tropical’ beer. 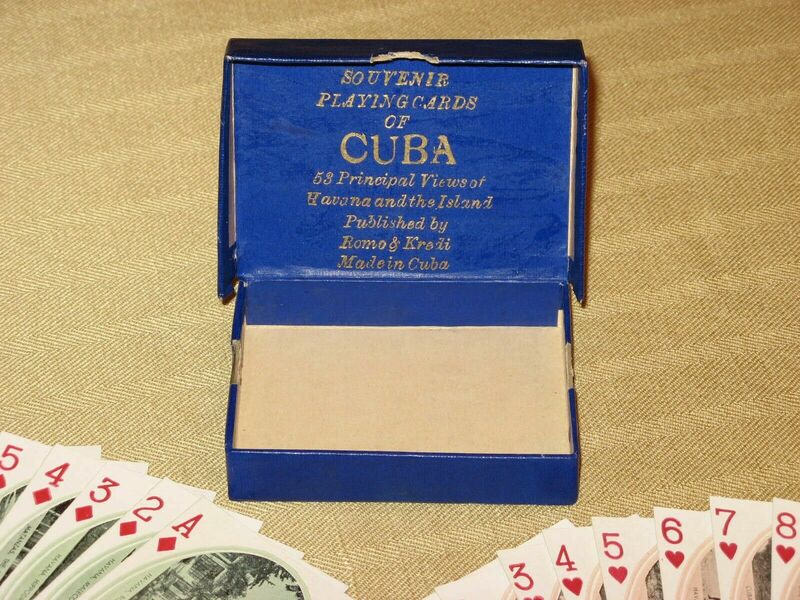 Several Cuba Souvenir packs are known either manufactured by USPCC or else anonymously in Cuba. Cuban biscuit company 'La Balear' issued American cartoon playing cards featuring Popeye, Donald Duck, Goofy, Marx Bros etc. during the 1920s-30s. There have also been several cartoon pin-up decks published in Cuba, probably for the amusement of US troops stationed there. 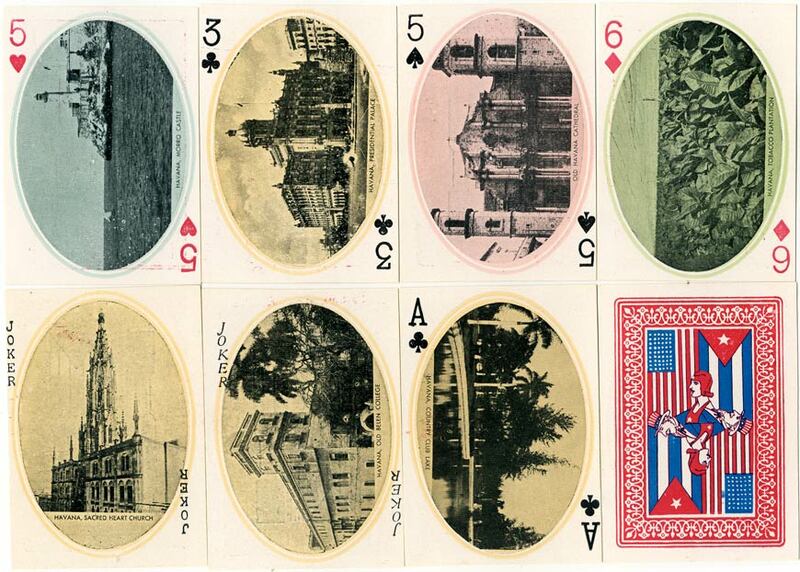 Above: Souvenir playing cards of Cuba, c.1915; 53 views of Havana and the Island, published by USPCC for H.T. Roberts. The backs can have either black and white, black and blue or black and yellow colour scheme. Several different coloured boxes are also known (blue, red, orange...) and these usually had a Cuban tax stamp fixed outside the box. 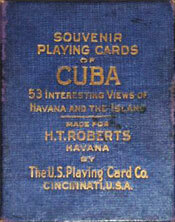 An earlier Cuba souvenir deck had been published by Romo & Kredi, c.1905, with dancing figures on the backs. 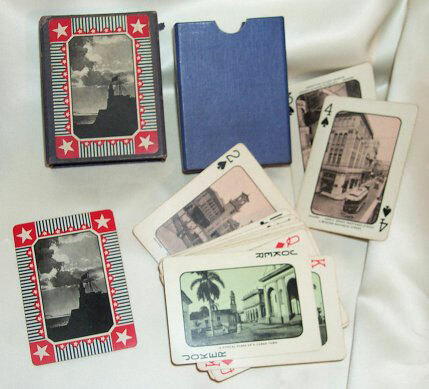 Above: Souvenir of Cuba playing cards pulished by Romo & Kredi, of cruder quality than the above example and with oval photographs and square corners, c.1930. 52 cards + joker in box. The red, blue and white back design signifies an alliance between the USA and Cuba. Above: wrapper from Catalan type pack manufactured in Barcelona by Juan Roura and exported to Cuba in c.1950. The Cuban importation tax band is wrapped around the outside of the wrapper. For more information about tax bands on Cuban playing cards click here.